This micro climate is created by the mist for one of the tallest waterfalls in the United States. The Upper Mesa Falls is in eastern Idaho near the towns of Victor and Driggs. 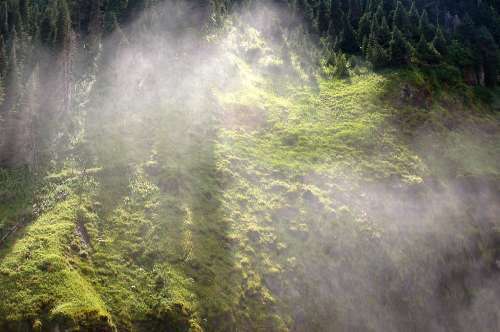 Surrounding the area is a forest common to the north american rocky mountains, which consist of a lot of pine trees; however, the mist from the waterfall constantly showers this cliff which creates an entirely different climate full of moss and other plants that thrive in areas with tons of water. The closest thing I can think of that would be a similar climate would be a jungle rainforest.